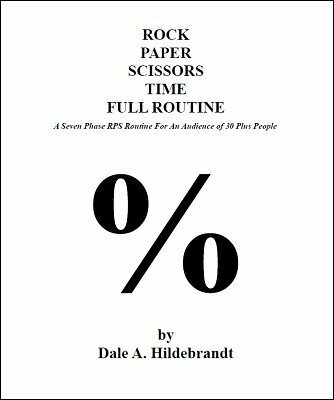 Rock Paper Scissors Time Full Routine is a seven-phase routine intended for audiences consisting of at least 30 people. This routine is presented as mentalism and is best suited for adults. The first three phases are kinds of Macro Effects which lead into the next four phases which are best perceived as kinds of Micro Effects. The first three phases utilize true strategies used by professional Rock Paper Scissors Players (yes, there really IS such a thing!). These Phases are best used with a group of at least 30 people in order for the effects to be successful and to advance the routine to the later Phases. Phase Four uses a prediction which turns out to be correct. Phase Five can be performed long distance through the phone, over the radio, or even through postal mail. It is based on a Larry Becker routine, and the method allows you to win more games of RPS than the volunteer or lose more games than the participant at your discretion. Phase Six of this routine can be presented one-on-one or for less than 30 people and can be performed impromptu with just a pen and a BORROWED business card! This is Dale's favorite part of the routine and he often performs Phase Six to impress potential clients. Phase Seven uses yet another ploy to make sure you are the winner. This is Rock Paper Scissors Time Full Routine .